Iron Company was kind enough to send to me a custom-sized and custom dated Forged Passion Power Belt to check out. This is a review for that belt. 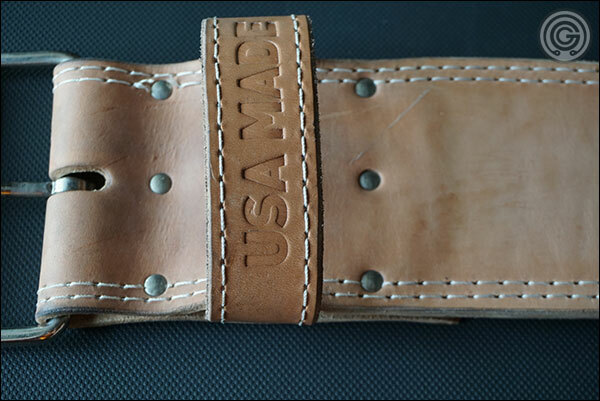 The 13 mm, Forged Passion Belt is a made-to-order leather powerlifting belt. 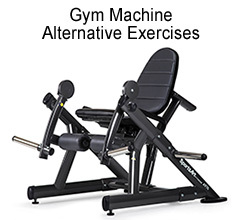 It’s assembled in the USA using two thick layers of premium sole leather rather than multiple thin layers of cheaper leather and filler materials. 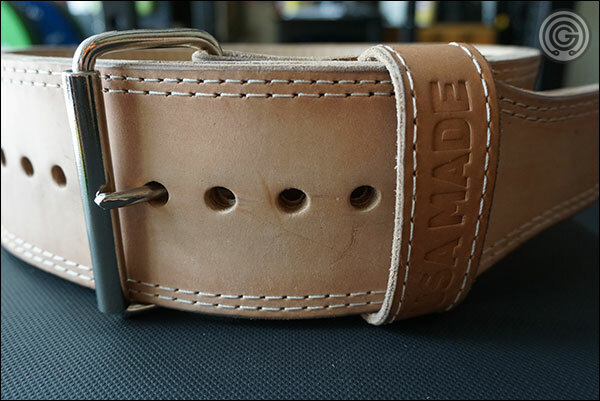 Heavy-gauge, nickel-plated steel rivets are used to affix the single prong buckle and leather loop (both for durability and for aesthetic reasons) while the whole belt is double-stitched rather than being single-stitched. As I think you will come to learn, this is a very sweet power belt – very attractive, functional, and durable. Let’s take a look! 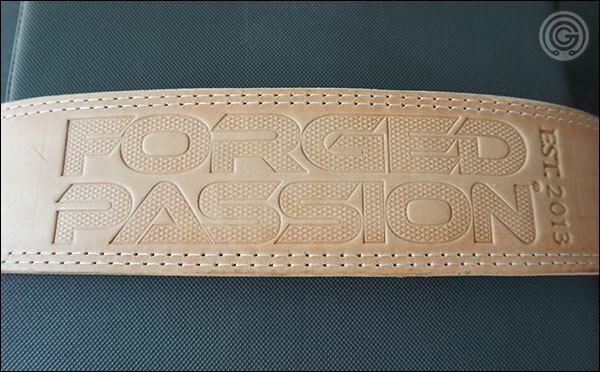 Here are the specifications for the Forged Passion Belt. 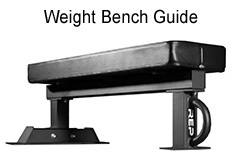 You can find all this information on the belt’s product page as well. * For no additional charges the date can be changed to whatever date is important to you. 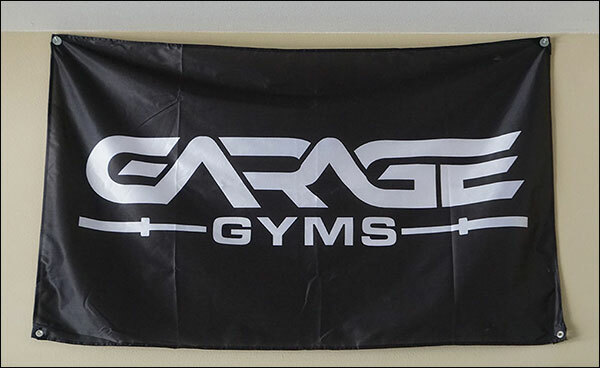 I chose the day I officially formed Garage Gyms (2013), but another suggestion given was to use the date that your strength training journey started. 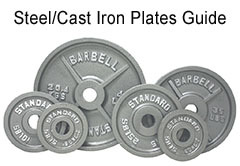 In case you are wondering, the default year of 1997 is the year Iron Company was started. Well there is just no denying that the Iron Company Power Belt is a classy looking piece of gear. Rather than going with colored suede or a dyed leather, Iron Company went with the more natural, old school leather look; choosing to let the bold, Forged Passion stamp draw in the attention rather than using bright, flashy colors or complex embroidery. As far as the stamping and branding goes, it’s very well done. Iron Company is stamped on the inside of the belt where only the owner is likely to ever see it, USA Made is stamped on the belt loop which I think looks just fine, and of course Forged Passion with the established date is stamped on the backside of the belt; which due to its industrial, knurled appearance looks pretty damn cool to me. It’s a great looking belt. This power belt really looks like it’s going to last forever. Its substantial 13 mm thickness is achieved with only two pieces of thick, high-quality sole leather. 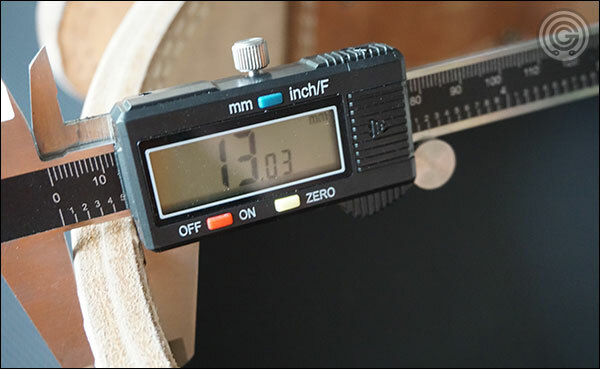 There’s not multiple layers of cheap, thin leather, nor are there any non-leather fillers worked in to achieve the desired thickness (not an uncommon practice, believe it or not). The quality and thickness of the leather allows for a far less complicated assembly process than stacking, gluing, and stitching multiple layers of various materials together (leather and fillers). 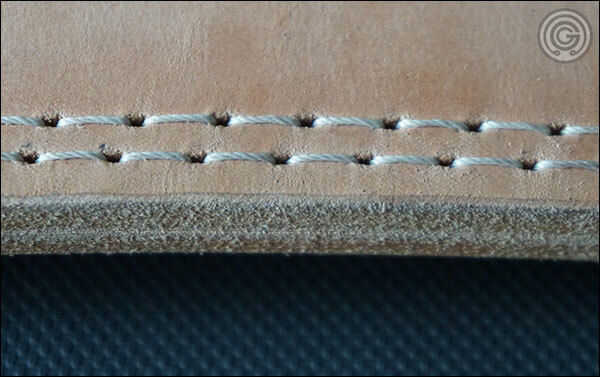 This, in conjunction with two rows of heavy-duty stitching; is what makes the belt so durable. In terms of the rivets used, they are actually pretty standard; reminiscent of what is used on Pioneer belts. They aren’t the over-sized monstrosities found on the Inzer belts, but to this day I have yet to hear of any rivet failing so I tend to not look too much into this. I have zero doubt that an Inzer rivet can technically take more abuse, but I’m also certain that the level of abuse required to destroy any belt’s rivets would destroy the belt itself (the leather) first. My Pioneer belt is a suede belt, but you can see that the rivets and the buckle design is exactly the same on the Forged Passion Belt. Both belts share the same suppleness when new as well. Are they both Pioneers? 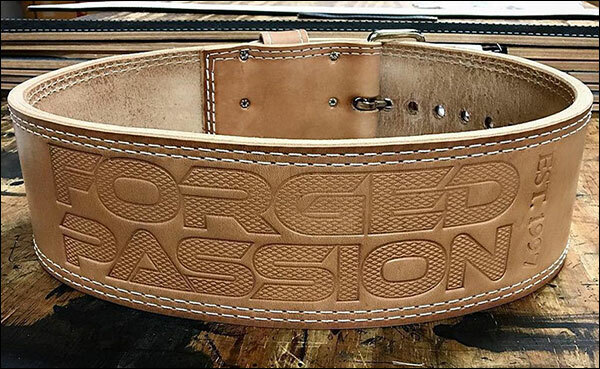 At the end of the day I think the Forged Passion belt will go the distance; the same distance as a Pioneer belt. Matter of fact, I wouldn’t be surprised to learn that Pioneer is making this belt (see above image). I don’t know that this is the case, but I sure wouldn’t be surprised. Another thing that makes me wonder about the Iron Company belt being a Pioneer is that it requires pretty much no break-in; even at 13 mm thick. The belt is supple, comfortable right out of the box, and it won’t require any twisting, turning, wetting, baking, or any other tactics that people typically use to break in something like say an Inzer belt. Still though; whether this is a Pioneer belt or some other manufacturer’s belt entirely, what’s important is that the Forged Passion Power Belt is a high-quality lifting belt. 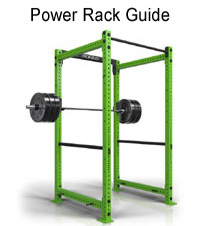 Pull it out of the box, strap in, and get under the bar without the discomfort associated with many brand new power belts. Not only do stiff, unbroken power belts dig and pinch until they are broken in, they also tend to require two hands and some form of anchor to put on. Additionally, the tapered end of the belt doesn’t bend enough to get it into the loop, and feeding it through requires a bit of work as well (lots of pounding). Of all the natural leather (non-suede) power belts on the market, this is probably also one of the nicest belts available. 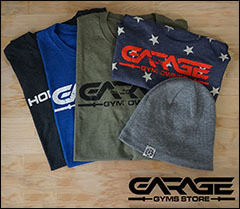 It’s made by hand rather than being mass produced like say Mark Bell’s Raw STrong Belt or the Rogue Ohio Belt; two very popular belts that incidentally cost about the same as the made-to-order Forged Passion Belt. I’ve used belts of varying qualities and I believe the Iron Company Forged Passion Belt is a high-quality belt, and a viable option for those wanting a supportive yet comfortable, 13 mm power belt. 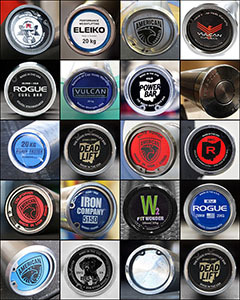 It’s classy looking, the Forged Passion stamp looks great, and the pricing; while not so low that it’s like an auto-buy; is super reasonable considering what many companies are charging for cheaper, mass-produced belts. 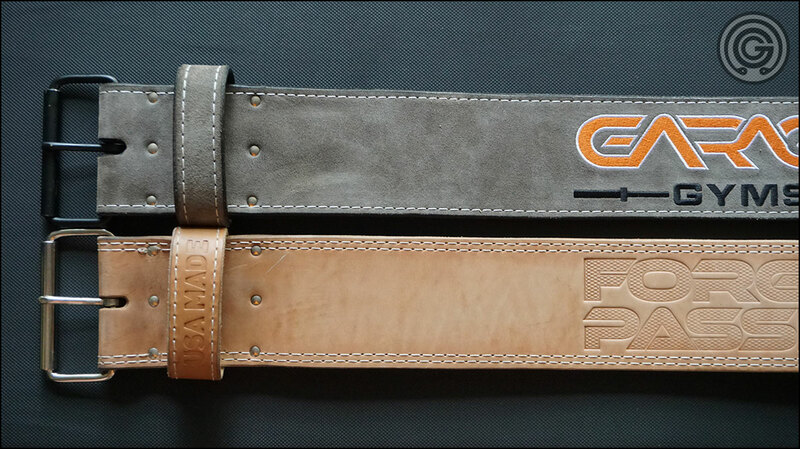 So if you are not looking exclusively for a suede, embroidered lever belt, at least compare the 13 mm Forged Passion Power Belt to your current front-runner. It’s a fantastic belt, and like I said I have no shortage of other power belts to compare it to so I like to think I know a decent power belt when I see one.